I love FarmVille. The first step is admitting it. If you don’t know, FarmVille is an application game by Zynga on Facebook. The goal of the game is to manage a virtual farm by planting crops and orchards, raising animals and harvesting/collecting the fruits of your labors. As you play, you gain both gold and experience points. Experience points count toward levels, each new level unlocks new plants/animals/items to purchase and the ability to expand your farm. Gold can be used to purchase seeds for planting, animals and various decorations for your farm. You can also get items and bonuses for unlocking achievements or “ribbons,” usually for doing things like planting a certain number of crops, milking a certain number of cows, etc. 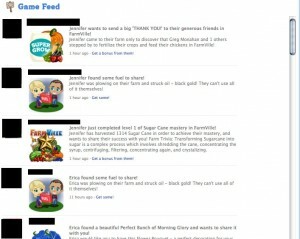 Another large part of the game is interacting with other Facebook friends who play FarmVille. You can add your friends as neighbors. The more friends you have as neighbors, the larger your farm can be. Friends can visit each others’ farms and fertilize crops/feed their chickens giving them bonuses when they harvest. There are a number of free gifts you can send your friends to help them with their farms including trees, animals, decor and building materials. Another bonus to having friends that play are news feed updates. When a friend makes a certain achievement or finds a special item like a lost cat or “lonely bull” they have the option of sharing it on their Facebook feed, leaving the item up for grabs for other FarmVille-playing friends. 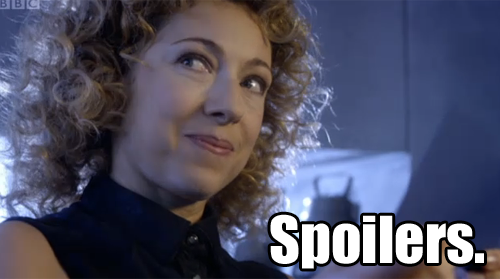 There’s the basics. Now I’d like to share some tips/tricks I’ve learned that have aided me in playing the game. But, Amber, I hate FarmVille. How do I never hear about your stupid chickens laying eggs? First thing’s first, I understand that not everyone gets or even likes FarmVille. I’ve heard of frustrated people getting bombarded by FarmVille updates in their news feeds “defriending” people. This is completely unnecessary. 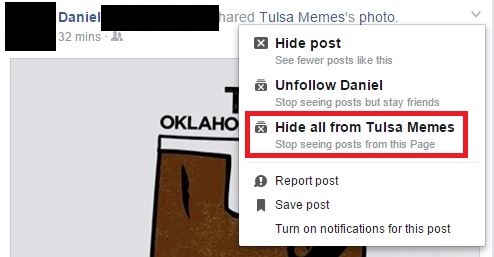 If you don’t want to see FarmVille updates, or any other updates for that matter, Facebook has the option to hide them. As you can see in the image at left, I’ve highlighted the “hide” button. 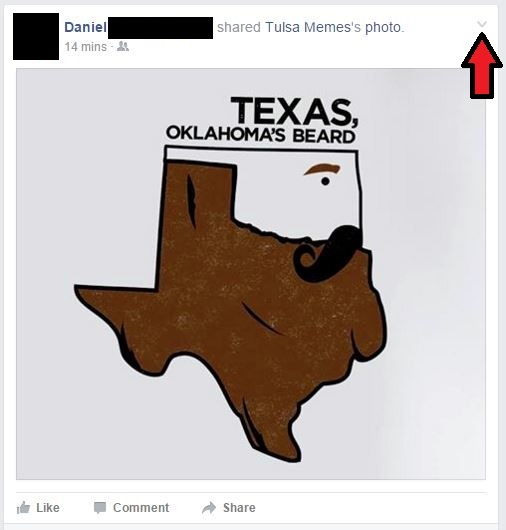 It appears when you hover over the right side of a news feed item. Click on it and it will give you the option to hide FarmVille updates or, if you really don’t like your friends, all of their updates. Got it? Now on to advice for the FarmVillains who still want to play. 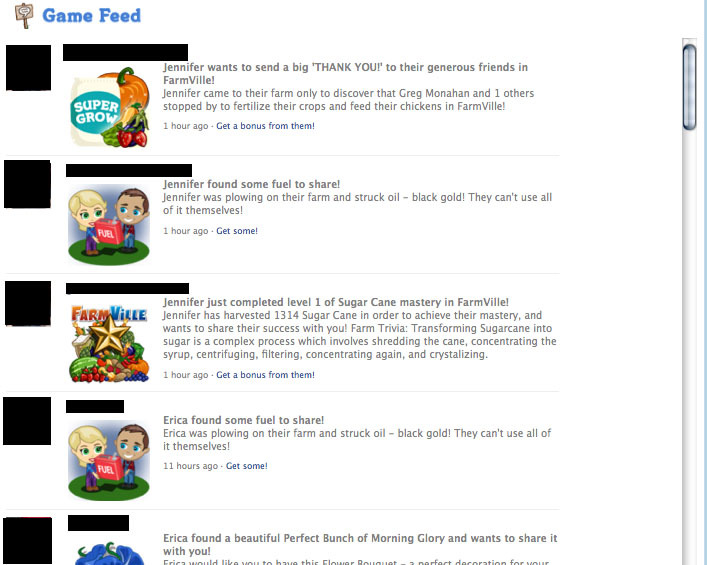 On FarmVille.com, there is a convenient game feed (pictured right) below your game window. If you’ve ever been frustrated because you were too late on a game bonus as a result of getting lost in your Facebook news feed, then this will come as a relief. 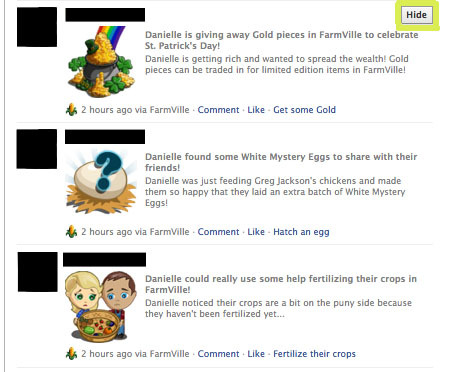 It places all of your friends’ FarmVille updates in one place. I’ve gotten so many more coin bonuses, free animals, gas, flowers and collectibles since I started using the Web site. I’ve also been better able to help friends requesting certain items or looking for help to upgrade their storage/chicken coops. 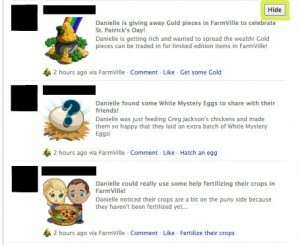 Another positive side of using the is exclusive gifts to send your friends that can only be found on FarmVille.com. Another way I like to play, and this is not limited to FarmVille.com, is in full screen mode. It’s especially useful when your farm gets large so you can better see everything. This is done by clicking the button on your tool bar that looks like a little square on a big square next to the “+” and “-” zoom in/out buttons.